Go ahead and tick another item off Godolphin’s growing list of accomplishments. The blue army, just months after winning the Caulfield and Melbourne Cup last year, can now claim the $2 mil Magic Millions 2YO Classic to their name following Exhilarates’ triumph at the Gold Coast on Saturday. Kerrin McEvoy has now won over $6.5 million more prize-money than other jockey this season. Photo Credit: Steve Hart. As their first ever runner in the Classic, Exhilarates opened as a $4.00 favourite with Ladbrokes from barrier 7 – but nothing came easy for the two-year-old filly. A wide open race made up of rival Unite and Conquer, Dubious, Hightail, and Czarson, left punters with plenty of options in the feature race, as well as a nervous feeling after Exhilarates missed the start to find herself second-last at the turn. With Kerrin McEvoy on-board though, no sweat. 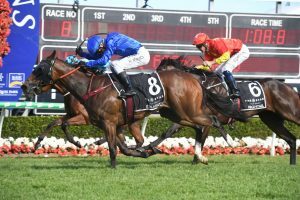 Just months removed from winning The Everest and the Melbourne Cup, the champion jockey steered Exhilarates to an outside position behind Hightail down the straight, and burst clear to steal a win at the line from second place-getter Dubious. “Huge buzz to win my first Magic Millions race, lucky enough to do it in Sheikh Mohammed’s colours” McEvoy told Sky Racing. Hightail also found herself towards the back of the pack early, but you could argue Hugh Bowman deserved to win the race, whereas Exhilarates probably didn’t. After the original plan to sit just off the speed fell through, some careful craftsmanship from McEvoy made a difference, but in the end, the filly by Group 1 winners Snitzel and Samaready turned on her dazzling turn of foot to earn trainer James Cummings his first ever Millions win. “She got squeezed at the start, but she’s experienced and she’s seasoned, and that stood her in good stead” Cummings said. “Two starts ago she got squeezed at the start at Wyong, and I think she should’ve beaten Unite and Conquer that day. In a race twice won by Bart Cummings, the win was extra special for the winning Godolphin trainer. After purchasing Exhilarates for a hefty $600,000 at last year’s Magic Millions yearling sales, Cummings also claims it’s great to give back to Australian racing. “One of the reasons that’s really good that we’re back buying yearlings like Exhilarates is it shows that we’re a part of Australian racing,” Cummings said.